Quite the small set – both in set size and size of the stickers themselves. Each of these mini-stickers came wrapped in a clear cellophane wrapper, and were inserted in specially marked bags of Frito-Lay potato chips during the 1988-1989 season. 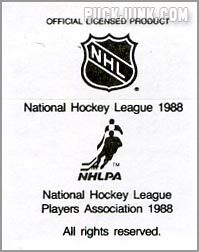 These stickers are unnumbered, and all feature the same back-a removable backing with the NHL and NHLPA logos, as well as a copyright date of 1988. Also available was a poster for this set, which measures 20 inches tall by 30 inches wide, that you could affix the stickers to. 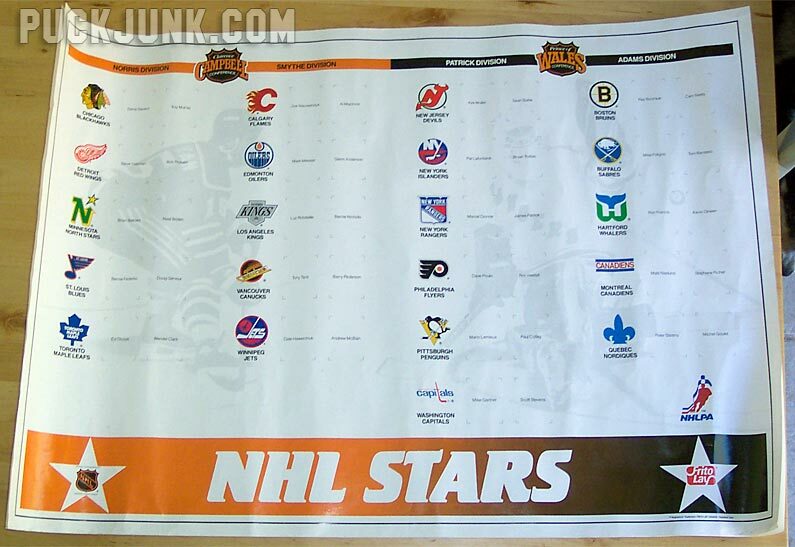 The poster has logos for each team, as well as a spot for each player, neatly arranged by Conference and Division. 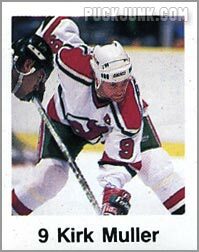 Ghosted in the background of the poster is a picture of New York Rangers goalie John Vanbiesbrouck making a glove save on a shot by New Jersey Devils forward John MacLean. An interesting note about the poster is that both the Montreal Canadiens logo and the Quebec Nordiques logo are absent. The Habs’ logo is replaced with the words “Canadiens”, while the fleur-de-lis takes the place of the Nords’ logo. 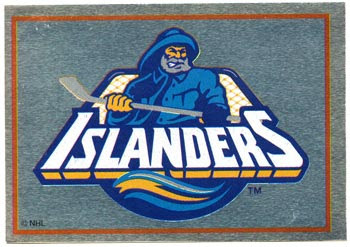 Kind of odd that those were the two teams whose logos were omitted. Then again, it may have had to do with the fact that the contest/promotion was not available in the Province of Quebec. 42 stickers make up this set, which has two players from each of the 21 NHL teams. 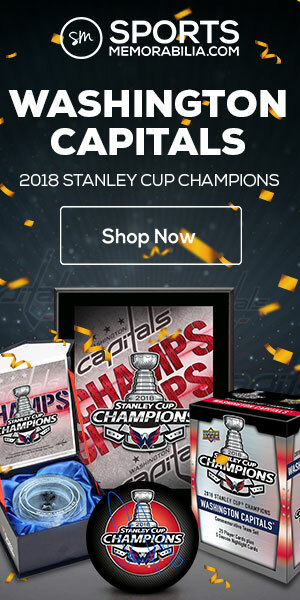 Frito-Lay did a pretty good job at picking the best two players on each team (Mario Lemieux and Paul Coffey for the Penguins, Scott Stevens and Mike Gartner for the Capitals, and so forth). 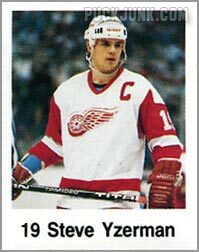 However, one huge, notable and even glaring omission is Wayne Gretzky. 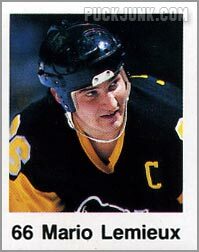 While this was Gretzky’s first season as a member of the Los Angeles Kings, he is absent from this set, which instead features Kings Luc Robitaille and Bernie Nicholls. I’m assuming this is because Gretzky was just traded to the Kings, and no photos of him were yet available of him in his new uniform. 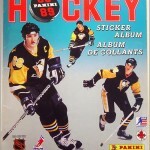 But the lack of a Gretzky sticker in this set makes it a rather inexpensive find. 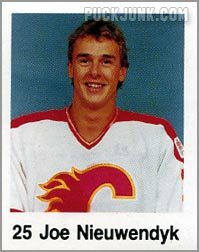 Not much to say here…a small photo, white border and black name and number. But that’s OK. These are small stickers, so they thankfully don’t try to cram in too much visual information. Some of the photographs look like they were taken from their respective teams’ yearbooks or press guides. These close-up shots actually work better, as these cards are really too small for action shots. None to speak of-and none expected. 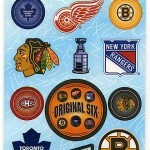 These are stickers–and really small too–so you can’t really compare them to hockey cards. 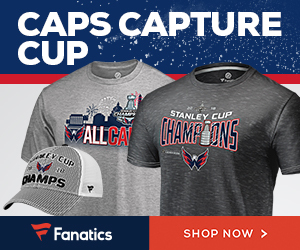 Don’t pay a lot for this set. While it does have stickers of many great players, it’s nothing to write home about. Special thanks to Al Kawamoto for the photo and information about the Frito Lay poster. 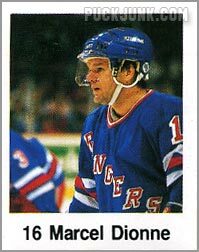 Marcel Dionne – one of the last cards of this amazing Hall-of-Fame player. 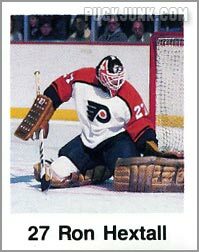 Ron Hextall – Hexy falls to the ice to make the save.